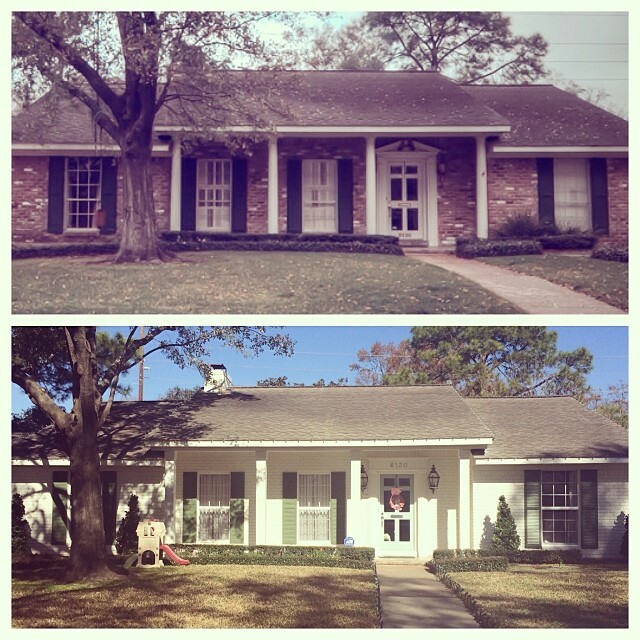 Bailey McCarthy posted this exterior before and after on Instagram a while back, majorly catching my attention. I love a well-proportioned small(er) house and this photo shows exactly the kind of potential these homes can have. A coat of fresh paint, some simple detail changes around the door and very light landscaping...that's all it took to quickly maximize this house's curb appeal. You know I love an old house so I get happy when I see wonderful results like this. And if you're interested in seeing the home's interior, here's the whole house tour (it's amazing, obvi). Amazing tranformation! So tasteful and classic. Inspires me to whitewash my brick colonial. I love the painted brick but my husband would never go for it. We live in the PNW where exteriors take a real beating. Brick is not so common here anyway and we also have real (not the newer peel and stick) stone. Do love this transformation. Gorgeous! Guessing it is in the SE or TX...very much that look. Looks like they changed out the columns too to something less formal. Much improved.